It has really good reviews on the Boots site, which i have to say i didnt even look until writing the blog now, so the views i have are really my own without any kind of influence! As im trying the Nip & Fab Dark Circles i thought i'd try a new moisturiser too. I have quite oily skin, so it's a balancing act to get one that's not too heavy but still does the job! The owner of blog British Bargains and Beauty! kindly sent me tube to try as she didnt get on with it very well, which is like any product -what suits some, may not suit others. So, ive been using this for 4 days now. Even on the first day i LOVED it, it smelt gorgeous! 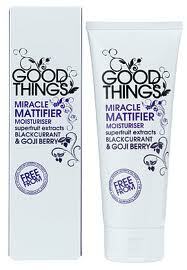 It does say on the front of the tube "superfruit extracts Blackcurrant and Goji Berry", and oh they smell sooo nice when you're putting it on! The moisturiser is suitable for so many different types of people because of its lack of many types of ingredients. So Vegans and vegetarians are specifically named as suitable for due to the lack of animal ingredients! The cream comes out really really thick -which is unlike most face creams which come out quite thin and you have to be careful how much to squeeze so you dont end up splatting everywhere with runny cream! However, its a good idea not to squeeze this either -only because you dont need alot of it to cover your face and neck. So a gentle squeeze is only needed each time, so in theory it's going to last quite a while! So you can see how much that little blob of cream would cover. It's incredibly nice to put on, very smooth, not at all greasy and is absorbed over the whole face within minutes. In the mornings, my face does feel that extra bit smoother, and the only things ive really changed in my cleansing routine is adding this moisturiser. FINAL WORD - i LOVE this! I had been using a Biore cream that was for oily skin, but they have discontinued it. I have one more tube of that, but i have to say, after i run out, this might well be my choice of moisturiser. It's so nice on the skin, it's a great price, left my skin feeling really smooth, so how could i not love it! However, always remember, that what might suit one might not suit another. My blog friend didnt get on with it, if you remember but yet i love it. As usual, its a case of trial and error, but personally having combination of oily skin and 33 years old, i love it!